This is a summary of our activities, other than our normal Club Meetings,.over the past twelve months. You can also view our Club Meeting Notes and Club Bulletin in the "What we Do" area of the Home Page of this website. 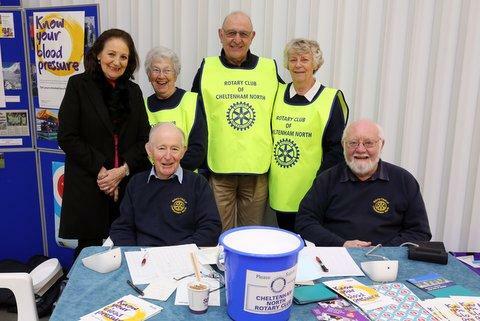 Cheltenham North Rotarians supported the annual "Know your Blood Pressure" Day, in association with the Stroke Association, together with the Cheltenham Rotary Club, between 10AM and 4PM in the Regent Arcade This a country wide event involving Rotary Clubs through-out the UK. Cheltenham North Rotarians, Partners and friends organised and supported the fourth Annual Wine Festival at the Pittville Pump Rooms . The event was a great success with many favourable comments received from both exhibitors and tasters. The proceeds of the event are in aid of Rotary Charities which we hope will prove equally successful as the event itself. President Beth introduced Tony Pawley to the Club Members as a new member at our meeting on the 4th April. Tony joins Cheltenham North from Poole Rotary Club. Previously Tony had been Club President, Secretary and Assistant District Governor. The Club provided the refreshments, Anne and Monica and also acted as Stewards at the event. A group of 22 Cheltenham North Members, Partners and friends visited the National Star Centre at Ullenwood. They were given a guided tour of the excellent facilities. Afterwards the group enjoyed lunch in the Star Bistro. We are grateful to President Beth for organising the visit. In football a hat trick of goals is considered a brilliant achievement by any player and if the team goes on to win the league then the champagne corks start popping. Unfortunately our only hat trick was to lose again for the third time. So I congratulate my team of achieving a hat trick!!!!!! Yes we went down 296 to 272 so congratulations to the stronger side Worcester V.
I of course will be considering my options as team manager !!! From the serious of pictures of our President Beth you can see how the evening went towards the end - Oh No not again - straight through the middle!! Organised by the Club Community Service Committee a number of Cheltenham North Rotarians provided afternoon Tea/25th Birthday Party/Quiz for an afternoon get together for the Happy Circle Club at a local Church Hall in Charlton Kings. They were introduced to the members by President Beth. Well a good evening of fellowship with Pershore Rotary was held last Monday at Cleeve Hills Golf Club whistst the two teams battled out a skittles match. The match it self was a little bit like the England v Scotland rugby match last weekend. The home side was well and truly in the lead at half time 180 points v 174 -Pershore. Well I can only blame the beer and food break as it all went to pot in the second half and soon Pershore had taken the lead and ended up the rightful winners. We look forward to a better result against Worcester Vignornia next Monday. A group of 16 people from Cheltenham North Rotary Club supported the dinner at Hatherley Manor to celebrate the 50th Defibrillator. The event was well attended with 210 tickets having been sold. We had quite good weather and a large number of visitors came to our tea room. We counted over two days that we had served tea and cake to 809 people plus a few dogs. This was a real club effort with the helpers allocated to: taking the money at the door, keeping the urns boiling the water to fill the tea pots, the tea servers, the cake servers, the table clearers, and the chain gang in the kitchen washing up non-stop. We had 2 shifts per day and everyone worked hard to make the whole event a great success. We charged £4.00 for a cup of tea and piece of cake, and less for only one item. I am delighted to tell you that all this hard work produced the magnificent sum of £3,101.60p for our charities. So a huge “thank you” to all who helped to make this such a successful event, and who worked with enthusiasm and good humour to provide the teas and cakes for our many visitors. We were complimented on our excellent baking skills. We were wearing aprons to advertise the Wine Festival, so who knows, we may have many more now buying tickets for that event. They were introduced to the Club Members by President Beth at our meeting on the 17th January. In my first season as team manager/captain I was sacked and then re instated after the final round although I was hoping to go with a 15 million contract package like some football managers!!! Cheltenham North arrived at the venue in their droves - Myself, John, John, Roger, Eric, Shirley, Andrew and Clive. The match got underway against Evesham to which Cheltenham pulled ahead in the first leg only. As you will see from the scores on the picture our accuracy went down the alley !! !so to speak, and we were well and truly behind until the final leg. It was then being discussed amongst the Cheltenham team - was their new manager any good and up to the job. At this point I tried to negotiate a leaving package!!. However in true spirit of knowing this was my last game I encouraged the players to give their all in the final leg we only had 19 points to make up just to draw the game. Shirley came to rescue and scored 13 in her final leg. The rest of the team also rose to the occasion and we began closing the gap one by one until the final throw by Evesham of the match whereby they need two skittles to win. My managers position is safe for another game!!!. Our Team Manager Kevin was not well during the evening and had to leave early so that is our excuse. Onwards to our two home matches details to be advised. All four officers were voted unanimously by the Members present. NB the current President Elect automatically becomes President. The Club held its 41st Annual Carol Concert in the Princess Hall of Cheltenham Ladies College on the 18th December. Compered by Paddy Grimshaw with Michael Sanger-Davies on the Organ. There were performances by Innsworth Military Wives Choir, The Cheltenham Silver Band, Leckhampton C of E Primary School Choirs and Soloist Soprano Danielle Smithson. Over 500 people attended the event which raised £5100 for Rotary supported charities. During the month Cheltenham North Rotarians assisted at the Santa Fun Run and also packing Christmas Parcels for the needy of the area. The members, partners and guests present were provided with an excellent meal and entertainment. Pictures from the evening can be found in the Club Website home page under menu or the "What we Do" area and either Pictures of Events or Photo Galleries. PDG Rodney Hill formally introduced Kevin to the members; he and Kevin had become acquainted while members of 41 Club. SVP Michael Rouse read the Object of Rotary and the President inducted Kevin as a member of RCCN. Kevin expressed his thanks for being accepted as a member and undertook to play a full part in the activities of the club. They acted as stewards and assisted in raising funds for local causes. Members, partners and friends totalling 22 drove through the lovely autumn countryside to Much Marcle, home of Westons Cider. With the sun beating down many of the group had coffee and a chat outside the old buildings before Tom, our guide for the visit, assemble us beside the old farm house and began a very informative talk about the Weston family and the production of cider on the site. The farmhouse was built in 1611 and since 1880 cider has been produced on the site, the old press is still positioned near the house. Westons cider now produces 40 million litres of cider a year and exports to 40 countries worldwide with up to 25 varieties. Not only do they produce cider but there is a farm with prize organic Hereford cattle and sheep which are fed the mash from the apples. Around ¼ of the apples are grown on site with the remainder coming from local farms within a 50 mile radius of Much Marcle. Every year around 35,000 tons are required which come from 350 growers. The cider is sold around 1 to 1 ½ years after it is pressed. They do produce a small amount of Perry cider. We were shown the various stages of production, from the gravity fed washing system (most of the water used is from their own source and is recycled), the 40 oak vats, where the cider is stored, for between 3 and 18 months and later the outside storage tanks. The names of the oak vats and the storage tanks have such names, reindeer, football teams to ladies names, ‘Bubble’ & ‘Squeak’, two large storage tanks hold 42, 000 litres each. Although most of the cider leaves in kegs, between 2,000 to 3,000 leave each Wednesday or Thursday, there is also a large bottling plant which we were able to view from windows high above. Following the tour a short tasting session took place, one of the favourites was cider and rhubarb, a new variety, before having a very pleasant lunch in the restaurant…. . of course cider was used in all the main dishes! What impressed many of the group was that not only is this a large family run organisation, employing up to 250 people, situated in a very rural and picturesque location but the family also have a keen interest in the heritage of cider making and the environment. Many thanks must go to Sally Whittal for organising such an interesting visit on such a beautiful day. Our £2,000 donation has provided 20 bags for those children without a bag. 50 bags have been reserved for the new intake in April. Following a request from Luke Simon CEO of SIB the remaining money has been spent on a laptop and projector. Shree Kalinka school particularly asked if this was possible. Lis Foy, from SIB, who many of you will have met at our Curry Lunches and at the District Conference, was in Tenkanpur yesterday to present them to the school. Boules Update September 2018 Nigel Gilhead. We travelled to their home piste, conveniently situated in Gotherington. We all played three rounds, with a clear win for Cheltenham North of five games to one. 33 members and partners attended the second garden party lunch held this summer at Orchard House, Greet on 30 August. As the weather, although fine, was a bit cool the meal was held in the garden rooms where we managed to seat everybody at 4 tables. The various delicious puddings were given by some of those attending. It raised £538.00 . The first party was attended by 27 members on 5 August- both parties raised a total of £1,027.00 thanks to the generosity of those attending. The £1,027 will go a long way towards the cost of this year's solar lights project in Zambia by the Club joining with the Rotary Club and Rotaract Clubs of Lusaka and the English charity, SolarAid operating in Zambia. The project is to assist disabled children in some 300 poor families and and to provide solar lights for 3 clinics and a hospital (which sees an average of 1834 patients a quarter) which are without electricity. We fielded five members, John S, Richard P, Nigel G, John and Beth P, with four to play at any time. The terrain is on the flood management area, out of sight of the road, but we found it and the narrow car park entrance. For openers John S won his singles game and Richard P, John P and Nigel G won their doubles. Beth held the tape measure. For the next two rounds Richard P and John S partnered each other in the pairs, and after some persuasion Beth P partnered John P. To the delight of our President, who started the evening as a boules novice, this combination won all four of their games. A six-nil win to Cheltenham North. We then crossed the road, to the Northwick Hotel annex/bar, where we enjoyed a sociable drink with the Evesham players. Cleeve Vale came to play, it was rained off. Having surprised the landlady as we arrived early at the Sandford Park Alehouse in the pouring rain, and asking for our sandwiches to be served early; we were unable to arrange a new date before the competition ended. So we agreed to move on to the skittles season. Once again we fielded five members, John S, Richard P, Nigel G, Tony H and Andrew W, with four to play at any time. For openers Nigel G won his singles game and Richard P, Andrew W and Tony H won their triples. John S caught his breath and practiced, on the ever changing terrain. For the next two rounds Richard P and John S partnered up again with Tony H and Andrew W forming the other partnership. Despite having to break for 10 minutes while the rain lashed down, in that configuration, now playing on a dry-damp-drying-surface, we won two of the four doubles games. The result was clear win by Cheltenham North of four games to two. Recently Peter and Pat Watson and I travelled with 2 members of the Glos. Young Carers staff and 8 children (8–13 years) from the Racecourse railway station on a very shiny steam train to Winchcombe to have a BBQ at the Keenan’s home. Before we got to the station we saw the Keenans and Worthingtons waving very hard to us from the special look-out in the garden. When we arrived at Winchcombe station the children had fun playing with a selection of teddy bears dotted around, as this was a Teddy Bear Special Tuesday which the volunteer railway staff put on during the holidays. Further along the platform we found a railway carriage with push-button toy trains to play with, and so this was another fun thing for them to try out. Then we walked along the road, and on seeing the balloon on the gate post the children then rushed up the drive to see what was around the corner. It didn’t take them long to start playing football or jumping up and down on the trampoline while the chefs started cooking the food. they gave to the Young Carers. This group of young children miss out on a normal life due to their family circumstances, and this one day gives them a chance to have a fun day out with other children who have similar problems. I would like to thank Peter and Pat, Peter and Janet, and Andrew and Gill for their very good natured help with this occasion, and the Club for funding this special day, it is money very well spent. A group of members and partners visited the British Motor Museum at Gaydon organised by Tony Hughes. They enjoyed a one hour private guided tour of the museum, followed by free access to the museum and the adjacent car collection centre for the rest of the day. Lunch was taken in the cafeteria. Our President for 2018/19 Beth Phillip introduced the evening with an overview of the Club and its membership and activities. This was followed by presentations from the Committee Chairmen that included a review of the previous Rotary year and our aspirations for the forthcoming year. The evening concluded with a summing up by President Beth and a review by District Representative Assistant Governor Graham Ogden. We are grateful to Janet Keenan for arranging a very enjoyable evening. Our Guest Speakers were Sophie Lydia Smith a former Miss Cheltenham and organiser of the competition and Ms Katy Van Hemelryk Miss Cheltenham 2018. They gave an excellent presentation on the event plus an overview of their careers. At the meeting on the 5th July President Steve told the Members that it had been at an honour and pleasure to have served as President for the past Rotary year. President Steve then inducted SVP Beth as President for the forthcoming year 2018/19. Beth duly presented a SVP medal to Michael Rouse, and JVP medal to Richard Purdon, and Steve an Immediate Past President badge. The “Beer and Cider Festival” was a great success. The sun shone, as ordered by Committee Chairman John Phillip, and the beer and cider, plus the odd glass of wine, flowed. Financially this was the most profitable year for this event and we have already arranged for an interim payment of £3,500 to the Hatherley and Redding Cricket Club, co-organisers of the festival, as Treasurer John is confident that their half-share of the proceeds will be at least that amount. Thank you SO much for supporting our Belmont 2018 Family Funday. Despite grey skies the event was a huge triumph, raising over £2,400 towards projects in both the Senior and Junior areas of our school. This was by far our most successful year to date. A record 45 pupils and 25 staff from The Ridge Academy contributed to a total attendance of more than 700 children and 200 adults, itself a record. Clearly Rotary has found yet another service which our community greatly appreciates. Once again the sun shone and the children raced from one favourite feature to the next. Except, of course, for those confined to wheelchairs or walking aids. The dedication of staff never fails to impress. I discussed her responsibilities with a young carer from St Rose’s School in Stroud, who was patiently feeding one of her palsied charges through a port directly into the stomach because swallowing was impossible or likely to cause inhalation pneumonia. The intense feeling of relief that one is not similarly burdened on a daily basis is hard to describe. I am very grateful to Roberta, Mary Ann, Ann (W), Beth, Mike (B) and Richard (P) for their contribution to such a successful and worthwhile event. On 9th June we enjoyed an “ Afternoon Tea Cruise” with the Willow Trust, one of our nominated charities for 2017/2018. We were blessed with excellent weather and it was a wonderful way to pass a sunny Sunday afternoon. A donation of £2,500 has been given to Willow Trust. Forty Four members Partners and Friends attended the Pudding Club to have a very enjoyable lunch including a selection of five puddings, which were voted upon. We are grateful to Eric Labrum for making the arrangements. The Elvis event was in the excellent venue of the Parabola Arts Centre and everyone there seemed to have a really good time. As an added bonus, the event actually made money, raising approximately £900. The Club AGM was held on the 17th May with Club Assembly being postponed until July to accomodate District. On 10th May we had the visit to the Jet Age Museum, which was very interesting with excellent explanations from the museum volunteers, followed by lunch at the Gloucester Old Spot. I have attached a bunch of pictures that show the lights being given and installed on the 3 orphanages, which completes Phase 1. The handover was done by myself and Drew for the SunnyMoney representatives as well as 2 from the Rotaract Club of Lusaka. All of the lights have been installed according to the information given, and you can see some of that here in the pictures. I have requested pics from them showing the lights at night, but this seems to be hard to get. I will continue working on that. As for phase 2 and 3, we are ready to go whenever you are. We have plenty of the lights in stock and could do phase 2 at any time. The cost for Phase 2 is about $1,516. For phase 3, we will need to have a set of lights arrive to be able to do that phase, and they will be arriving in July, so we are able to conclude Phase 3 in August or September time? As schools are out until the 2nd week of May, we could certainly do the handover in May or June time when the schools are back in session. Phase 2 is working with 12 schools that are very rural and have no electricity in any of the areas. We will be doing a schools campaign there in the next few weeks, so this will be a great time to get the lights out and have the teachers and community educated on what solar is. I will let you advise about the financing part, and then we will go from there. Over 400 enthusiastic wine lovers celebrated and raised a glass to the wonderful world of wine in the elegant Regency surroundings of the Pittville Pump Room on Saturday 7th April 2018 for the third annual Cheltenham Wine Festival. The event was again sold out before the day. Lucky ticket holders enjoyed an unmissable fine wine experience as they travelled by taste, discovering and savering samples from over 340 wines from some of the best wine regions in 20 countries. Additionally, foodies delighted in tasting delicious treats from the award-winning artisan cheese, charcuterie and chocolate producers present. The 30 wine experts exhibiting at the festival were on hand to guide those attending as they tasted an exciting range of wine styles and grape varieties giving them an opportunity to learn about the people and places behind them. We were delighted to welcome our Guest of Honour, Cheltenham Mayor Klara Sudbury, and would like to thank all those attending the festival for helping us to raise nearly £10,000 for both our Charity Partners Sue Ryder Leckhampton Hospice and Rotary Charities. With something for everyone, beginners to wine connoisseurs, The Cheltenham Wine Festival has become a much-anticipated event for wine lovers in Cheltenham’s busy festival calendar . We are already looking forward to next year’s exciting event on Saturday 6th of April 2019 and wine lovers can register their interest in attending now by visiting our website at www.cheltenhamwinefestival.com. During the afternoon 101 people had their blood pressure checked and 28 had been advised to seek further medical advice. Bernie, Mike and Geoff had operated the pumps and 8 other members had encouraged the public to avail themselves of the opportunity. and was inducted by President Steve. Robin was warmly welcomed into the Club by all the members present. It gives me great pleasure to send you pictures from the recent SchoolBag distribution that took place at Shree Kalika School last week on International Women’s Day. In all 80 School Bags were handed out to the children. The photos are lovely and not only show off the children and their School Bags very nicely but also provide good context to how the stock is transported to the school and how they are packed at the premises. You will notice that construction is still taking place at the school and some of the children are still learning in their TLC (Temporary Learning Centre). On behalf of the children at Shree Kalika and us here at School in a Bag, thank you so much for your continued support. We are so grateful to the members from the Rotary Club of Cheltenham North. Those of us who have played the game will readily agree that skittles for the mature participant is more a game of chance than skill. Take as examples our two most recent fixtures against Evesham on the 19th and Tewkesbury on the 28th. The alley at St Ecgwins Club is long and beautifully maintained whilst that at The Bluebell pub is short and bears the scars of frequent use and infrequent maintenance. Unsurprisingly, the pub feels obligated to offer a damp cloth in order to remove the dust and debris from the balls before use. But that is not all! Over the years the impact of ball on skittle has reduced the diameter of the skittles and therefore increased the size of the gaps between them. Dear reader, you will surely have guessed where all this leading. Your enthusiastic representatives prevailed by 7 shots playing under the elegant conditions of St Ecgwins but succumbed to Tewkesbury by 10 shots. Suggestions that our Tewkesbury friends had concealed sandpaper in the ball cleaning towel are scurrilous. The CCTV recordings would have confirmed this view but, unfortunately, they had been removed for routine maintenance! We have one remaining fixture this season. Worcester Vigornia failed to raise a team at the first time of asking. A walkover would significantly improve our record. This was an excellent production that was enjoyed by all. We are grateful to Janet Keenan for making the arrangements and obtaining two for one tickets.